Look on the side of the carbs for an imprinted model number. These aren't Keihin VB44A's are they? He should have VB44A carbs--presuming his bike still has what it left the factory with. Yes, I have the VB44A's. I noticed nobody responded to this. I"m not really sure what your question is. Please clarify? Sounds like a work around for choke plates that don't close all the way. Have you had them apart to visually inspect and make sure they operate smoothly and close completely? Are those the traingular ones like the '81 or the rectangular ones like 79? There are a few on ebay if you're not too picky. Some of the prices are stupid. IIRC, I replaced my missing one for around $30? Good news! Dealer can order the accelerator pump diaphragm. Bad news! They want $85 for it!! I'll be clicking the link from the moderator, thank you very much. Impatiently waiting until 10am Tuesday when the dealer opens to find out if I can order one. Until then, looking up aftermarket alternatives just in case. I had one in storage, I just found it this weekend. Day late, dollar short, huh. Congrats on the score! This is my accelerator pump shaft/diaphragm. Think it's still serviceable? I just found this PDF about accelerator pump bowls on the 77-78 CB750. Is the diffuser in the middle plastic or brass? 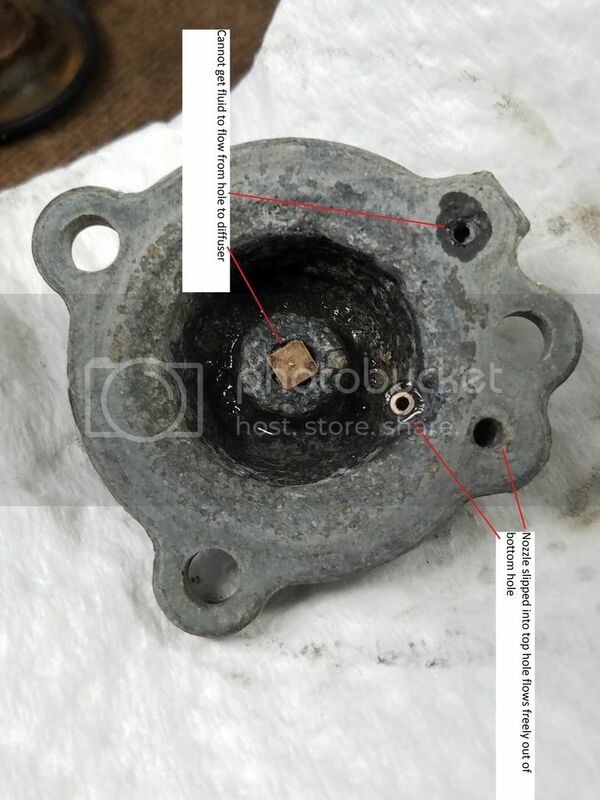 I was under the impression it was brass but now I'm left wondering... http://www.hondachopper.com/garage/carb_info/accelpump_valve_repair/Repairing_77-78_Accelerator_Pump_Valves.pdf .